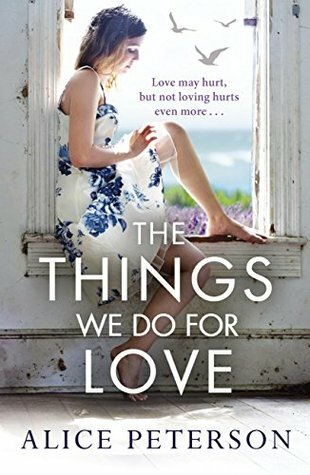 Review: One thing I love about Alice Peterson's books is that she always manages to create such unique and powerful stories that they stay with me for a long time afterwards and The Things We Do for Love is no different in this aspect. It made me laugh, it made my cry but, above all, it filled my heart with joy and hope. January Wild is one of those people who might seem quite ordinary at first sight but that when you start getting to know them, they blow you away with their strength, enthusiasm for living, and especially their love. Thanks to flashbacks to the past, we discover January's past. Bit by bit, Alice tells us short chapters of January's past: her childhood, her upbringing by her grandparents after her parents deaths, her relationship with her brother, her pregnancy and more recently her struggles with single parenting her daughter, especially when she discovers that not everything is going as it should. With every new bit of information I discovered about January, I was more and more at awe with her. And soon I got why Alice chose this title for this story, love can really move mountains, especially the one from a parent to their child, or even a grandparent. But despite all her baggage, January is finally where she wants to be: a job she enjoys, friendly colleagues, a nice house, a happy daughter... until her beloved boss retires and Ward Metcalfe enters her life. Their relationship doesn't get off to a good start but soon he becomes quite a big part of January's life, something she is not comfortable about. As January, I really was in two minds with Ward. He really seemed like quite a bad guy... but not all first impressions are true. One thing for sure I really enjoyed getting to know this mysterious man and even if he drove me crazy more than once, I ended up quite liking him. But the star of the story was definitely January's daughter, Isla. Her story was one of those that need to be heard. I always feel like Alice Peterson opens my eyes on topics I don't have much knowledge and with Isla's story I learned so much. Alice handles the topic with care and tenderness, it make you care for her characters as if they were part of your own life. Something very few author accomplish. The Things We Do for Love is an uplifting story, full of love that you cannot miss. Really worth reading, I can only praise it. If you already are an Alice Peterson's fan, you know you are in for a treat and if you haven't read anything by her yet, people you are missing out on great things.